These double chocolate grain free cupcakes will give any store-bought cupcake a run for it's money. They're not only delicious but so easy to make and topped with a creamy, chocolate frosting. These double chocolate grain free cupcakes will give any store-bought cupcake a run for it’s money. They’re not only delicious but so easy to make and topped with a creamy, chocolate frosting. I think cupcakes are one of my favorite desserts. What’s not to love? It like a personalized cake with a heap of creamy frosting on it. It also doesn’t hurt that they are just so cute! I admit it, I’m a sucker for cute little baked goods. 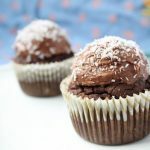 These double chocolate grain free cupcakes will give any store-bought cupcake a run for it’s money and on top of the delicious flavor it’s also a whole lot better for you that any store-bought cupcake. 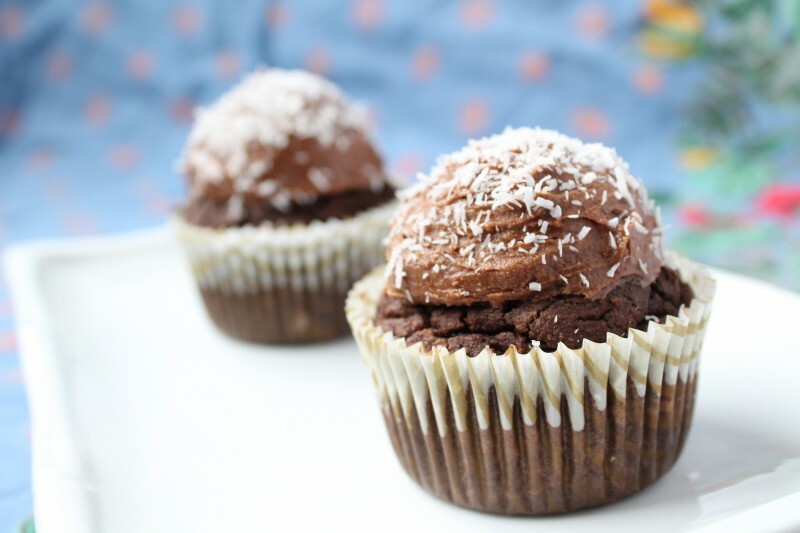 Have you tried these Double Chocolate Grain Free Cupcakes? Don’t forget to rate the recipe and leave me a comment below. You can also follow me on Facebook, Twitter, Instagram, Pinterest and YouTube. Place batter in a muffin tin lined with cupcake liners .The cupcakes will rise a small amount, so you can fill the muffin liner about 3/4 full–almost to the top. Bake for about 20-30 minutes or until a toothpick inserted comes out clean and the tops are slightly browned. Then add the cacao or cocoa powder and mix again. Keep in the fridge until the cupcakes are cooled and ready to frost. The frosting will harden if it’s in the fridge for longer than 30 minutes. To soften, leave at room temperature for 15-30 minutes then blend again with a hand mixer until it breaks up and softens. As long as you don’t re-publish the ingredients or the recipe and provide a link back to my blog in order to get the recipe, it’s fine. Do you know if this recipe can be made in a pan, like an 8×8, to make a cake? Would the amounts be the same? Great recipe! many thanks <3 . To make mixture go a bit further I tried bulking it out with a cup of apple puree and added an extra tablespoon of cocoa powder (I am finding using the alternative flours to be extremely taxing on the budget, so I am trying anything to make them go a bit further) They were incredible (especially the next day!) – So soft and moist and delectible! YUM!! can you use regular sugar and milk instead of coconut? Hi. These look gorgeous! Quick question about the amount of coconut milk, it just shows up as “2/3” coconut milk here. Is that 2/3 cup? Thanks!! Does anyone know the calories per cupcake without the frosting? You can use an app like My Fitness Pal to figure out the calories. This looks interesting. I’m getting a bag of coconut flour from a friend this weekend. I’ve book marked this recipe to give it a try. I’m interested in this coconut butter idea. My GodSon has 7 of the top 8 food allergies (he can do eggs). I think you could pipe it, but you may need to add some moisture from additional butter or coconut oil.